Bezos has also been up to some other cool stuff. The idea that I can diddle around on my laptop and purchase a novelty t-shirt from Oregon and I assume that it should appear on my Brooklyn doorstep in 48 hours is ludicrous from the start. Shipping will still be free with a Prime subscription, just slower in some cases. The advantages of having a Prime membership remain robust, since this only applies to certain merchandise sold by certain sellers. […] But Amazon has thoroughly warped my sense of shipping logistics to the point where reining in Amazon Prime benefits for the ease of the sellers is OUTRAGEOUS to a dumb corner of my brain. Amazon did this to me. The company’s winners dream up innovations that they roll out to a quarter-billion customers and accrue small fortunes in soaring stock. Losers leave or are fired in annual cullings of the staff — “purposeful Darwinism,” one former Amazon human resources director said. Matt Yglesias argues at Vox that Amazon’s work culture is so relentless because it’s a “startup that never grew up,” but Silicon Valley is exporting that startup culture to companies desperate for modernization, everywhere. So 24/7 digital communications, big data, and a veneer of world-changingness — the implements of torture for Amazon employees — are increasingly commonplace. Amazon, in other words, is not some dystopian outlier. It’s the new normal. It’s just a little more frank about its goals and intentions. Touchy-feely PR statements are no doubt on the way. A lot of people are going to be rushing to moral-political judgment about this (whatever the precise technical details of their arguments — which scarcely matter). Denunciation, predictably, will be institutionally selected for. Inconsequentiality will be total. There’s an industrial revolution taking place, now at the level of culture. The most sensible judgment at this stage would be restricted to: this is interesting. Here‘s the ‘Amazon Prime Air’ promo (December 2013), in case you missed it. Barring regulatory obstacles, Amazon would face an upfront cost of about $100 million to buy tens of thousands of drones. The company also would see expenses of about $300 million to deploy them to deliver 400 million orders annually, according to the report, which based its findings on existing technology and prices. 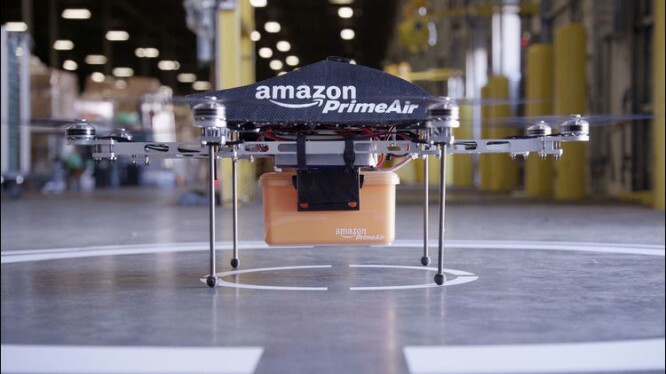 […] Amazon would need to hire thousands of operators, each capable of monitoring multiple drones simultaneously, to ensure safe takeoffs and landings, according to the study, which included the personnel cost in its calculations. Most of the drone flight would be automated, according to the study, which assumes each package weighs as much as 5 pounds and each delivery is no more than 10 miles. Amazon is, simply and objectively, the God of Time Spiral Press, or at least the Demiurge. Without it, existence would be impossible. It is reasonable, therefore, to expect an erratic series of devotional posts on the subject. Disintermediation of the publishing industry, and American drone revolution … The awe is almost intolerable.